Full disclosure: I am an active member of the United States Concealed Carry Association. 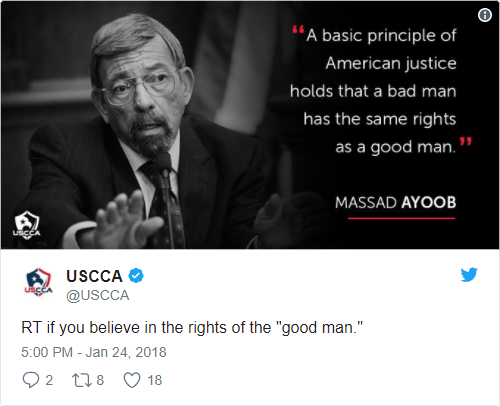 And USCCA’s tweet caption is: “RT if you believe in the rights of the ‘good man'”. It is a widespread and dangerous misconception that all criminals are fair game for the bullets of the good guys. A basic principle of American justice holds that a bad man has the same rights as a good man. When the pursuer lets his own sense of justice determine whether the chased is a man with the same rights as his, or a target of opportunity, the stage has been set for tragedy. Clearly Ayoob’s words are being taken completely out of context. The above paragraphs are reproduced from Chapter 3 called “The Dangerous Myth of Citizen’s Arrest”. The quote isn’t intended to be inspirational in any way, but more serve as a warning. The full context is in regard to an armed citizen assisting law enforcement in apprehending a fugitive, and the extent to which that citizen can use lethal force. Speaking in practical rather than legal terms, you are on thin ice any time you pull the trigger on the basis of anyone else’s judgment. Even if that command comes from a sworn officer, even if his judgment was correct, it is always possible that you could misinterpret his orders. While the quoted statement above is correct with regard to American jurisprudence, it is clearly not intended to be taken in any kind of inspirational fashion. Yet it seems too many do. Because they’ve only seen the quote, not the context. He who chooses to play the role of Citizen Cop does so at his own peril. A man requested by a police officer to assist the latter must do so, on pain of being a convicted obstructor of justice. But he owes it to himself to watch out for his own interests before those of the law or the community. Confronted with a fleeing felon, it is in the citizen arrester’s best interests to hold his fire. The question of whether he is responsible for the escaped suspect’s future crimes is less imminent and painful than the probability that he will be crucified for using more force than he should have. He must consider every repercussion that his every response could create, in light of laws and public opinion that will damn him from the moment he steps out of bounds. In short, the citizen arrester must cope with an intensified form of the socio-legal threat that every full-fledged police officer faces every hour of his working day. Note: if you wish to read the referenced book, you can reserve it through The Internet Archive.